Nongsa Point Marina & Resort in Indonesia has become the first marina in Indonesia to achieve Global Gold Anchor accreditation with a rating of 5 Gold Anchors from the Marina Industries Association. Richard Lofthouse, Managing Director of the Asia Pacific Superyachts Indonesia office, enthusiastically reported on the award: "Nongsa Point has been used by Asia Pacific Superyachts and our clients for some time as a jumping off point to the beautiful Riau islands as well as for boats heading further South. We have enjoyed a great relationship with Nongsa and would like to congratulate them on this achievement which serves to show what is possible in Indonesia". As the gateway to the Riau Islands, Nongsa Point Marina and Resort is an ideal location for weekend getaways and long stays. Its proximity to both Singapore and the many local islands enable boat owners to conveniently sail to nearby islands to relax and unwind over the weekend or pursue a wide range of boating activities such as cruising, fishing, diving, snorkeling, and island hopping. 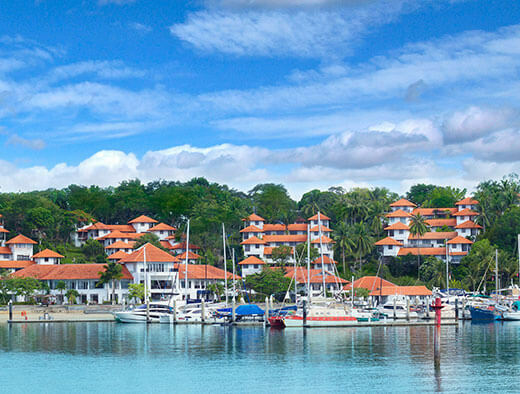 Nongsa Point Marina & Resort is an international boating and holiday destination on the northeast of Batam Island 35 minutes ferry ride away from Singapore's Tanah Merah Ferry Terminal, 20km across the Singapore Strait. The beachside resort has a mix of hotel, chalet and apartment accommodations. The international marina has 65 floating concrete berths including two berths for mega yachts up to 130 feet. Utilities, sewerage pump-out, and fuel are available at the marina. Nongsa Point Marina & Resort's General Manager, Mr. Erhard M. Rueber said, "It is a great honor to achieve this accreditation and lead the way for the maritime tourism industry in Indonesia. The Nongsa Resorts team members and I are very proud of our resort's achievement in obtaining 5 Gold Anchors. The very positive feedback provided by our marina guests that were part of our Gold Anchor assessment is a testimony to the excellent service and facilities that we provide. With this accolade, we aim to continue establishing Nongsa as a prime recreational marine tourism and cruising destination in support of the Ministry of Tourism of Indonesia's aims to attract global tourists to Batam."